Before this blog entry you may have already seen this baby in my 2013 beauty favorites post but that time, I just made a quick description of this product. Today I am now going to elaborate further on why I love Essential haircare so much. In a nutshell, Essential is a haircare brand made by Kao Corporation. Under the company's belt are other big brands like Jergens, Biore, Asience, liese, Laurier and Curel. Asience is their more matured haircare line and Essential is their teenage/young lady haircare line. Under the brand Essential, they have shampoos and conditioners in three variants as I type this (Nuance Airy, Rich Premier, Purely Smooth). And for both Nuance Airy and Rich Premier they sell spin off hair masks, leave on hair treatment milk and morning hair health spray (no it's not the hairspray for styling). 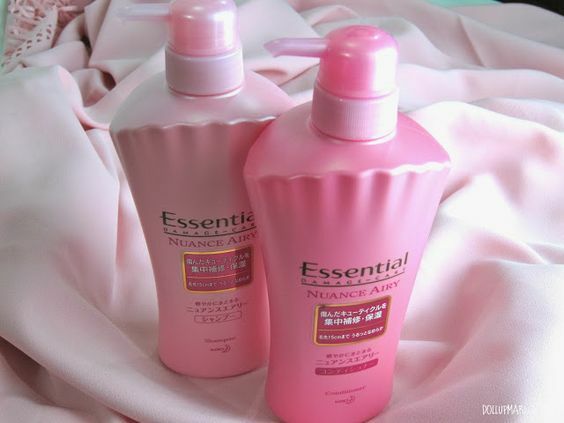 Today's review is on Nuance Airy's shampoo and conditioner set. I cannot tell you how much value for money this product gives. I bought this set in Hong Kong for 90 HKD (495 pesos), as in this set of 500 mL shampoo, 500 mL conditioner and a baby sized hair treatment milk that will last a short haired girl like me a month. The shampoo and conditioner set, if you only bathe once a day and in each bath you will religiously use just one pump (no more and no less), will last approximately five and a half to six months. I have yet to find a locally sold haircare brand that can actually pack as much value for my 500 peso bill. What made me further shocked was I was even able to save more money when I bought a newer set in Taiwan because the set cost only 210 NT (Php 315)! At this point there is no longer any haircare brand I know of in the Philippines that can beat this price for this size of haircare. I just LOVE what this product does for my hair. I have extremely oily skin, and extremely oily hair. But my hair has been trolling on me all my life and is oily yet slightly frizzy. The usual shampoos just make my hair oilier than it already is (if it's nourishing) or frizzier and with more chicken hairs (if it's meant to be cleansing). This is by far the only haircare line (aside from Asience, my other haircare love), that has made my hair smooth, silky, yet NOT oily. As in I can go 24 hours and my hair's oiliness levels are still acceptable! This is sooo not the case with other brands, given my oily scalp and the Philippine heat. Using other brands, after 12 hours, my hair is already oily, and by the 16th hour since the last bath my hair is already soooo oily that I look like I haven't showered in three days. This is the variant meant for lighter and bouncier hair, and before using this for the first time (like three years ago, before this blog was even born), I was actually quite wary that it might just make my hair too clean and squeaky and not solve the frizz problem. But no, this does everything I want a haircare set to do. I get bouncy, shiny hair all day. As for usage itself it forms a rich lather, which I think is good for those longer haired girls who want their shampoo to do more for them... It takes a bit longer than other brands to wash off because of all the lather, but the difference isn't that extreme to be a bad thing about this product. Oh and did I talk about the scent? My hair smells great the whoooole day (as in the whooooooole 24 hours kind of day). No oily smell, no icky gunky smell, just a light fruuty fragrance all day long. But don't worry, you won't necessarily smell like fruit salad when using this brand. The shampoo smells really really fruity, but the conditioner smells more neutral (albeit still scented) or more bland, and I think it's meant to complement the already very fruity shampoo. And the best part? Premium affordable haircare MADE IN JAPAN!!! This is the exception to the assumption that everything Japanese is expensive. Heck, this is even cheaper than most of the brands sold here in the Philipppines! The only sad thing about this product is that Kao most likely will not sell this in the Philippines anytime soon. These products are sold either in the 500 mL bottles I have here in my review or in 150 mL bottles. They do not sell this product in sachet, they only give out sachets in promotions. I am not sure if they will be willing to go through all the hassle to manufacture sachets to match the people's tastes here when their big bottles are doing very well in Singapore, Hong Kong, Taiwan and Japan. And endorser wise, they choose really cutesy (sometimes gyaru) girls like Suzanne, Vivian Hsu and Nozomi Sasaki, girls whose styles may not match the Pinoy ideals of beauty. So I am not sure if they are willing to change their brand image and hire a girl next door or glamorous girl to endorse the product as is customary with haircare endorsers here. Or if they're willing to make the kawaii lifestyle a nationwide phenomenon. I am still hoping that they will start to sell this in the Philippines though, even years away from today! This is probably the best and most affordable haircare brand and I think that everyone should try this. What's your holy grail haircare product? Please do tell me in the comments box!